Kelvin probe force microscopy (KPFM), also known as surface potential microscopy, is used in a wide range of applications, such as photovoltaic effects on solar cells, corrosion analysis of alloys, and surface analysis. Conductive AFM and KPFM are nanoscale electrical characterization tools that complement each other, and they are the most commonly used. Conversely, lack of measurement precision and repeatability as well as limited spatial resolution have restricted its use in certain major areas, such as in material discrimination in composite materials, detection of acceptor and donor domains in hetero-junction organic solar cells, and trapped or immobilized charges on insulators. Frequency modulation KPFM (FM- KPFM) and amplitude modulation KPFM (AM-KPFM) are the two critical KPFM detection methods. This article provides an intuitive and geometrically rational probe model to describe their radical variations in spatial resolution and precision. This modeling allowed Bruker researchers to integrate KPFM-FM with a novel AFM mode called PeakForce Tapping®™. This mode provides ease of use and concurrent quantitative nanomechnical property mapping capability through PeakForce QNM®. This latest approach, along with an auto-optimization software and a new probe design, has significantly increased the performance of KPFM. In 1898, Sir William Thomson, who was later known as Lord Kelvin, used a gold-leaf electroscope and found that copper and zinc plates placed on insulating shafts produced charge when they were allowed to come into electrical contact and then move apart. This discovery can now be explained with respect to work function variations. The work function refers to the minimum work or energy required to take out an electron from a solid, to a point beyond the surface of solid (or energy required to shift an electron from the Fermi level into vacuum). Figure 1 shows a diagram of energy and charge, illustrating the principle of Kelvin probe method. Figure 1. Energy and charge diagram illustrating Kelvin probe technique principle. Let us consider two different conductors, brought into electrical contact through an external wire contact. On doing so, electrons will travel from one conductor with a lower work function to the one with a higher work function, balancing the Fermi energies. If the conductors are made into a parallel plate capacitor, the surfaces will be induced with equal and opposite charges. The potential determined between these two surfaces is known as the contact potential difference (CPD), surface potential, or contact potential, which equalizes the work function variation of the two materials. As a result, CPD measurement is made relatively simple. The capacitor is applied with an external potential or backing potential until the surface charges vanish completely. The external potential, at this stage, equals the CPD. So far, the numerous Kelvin probe methods developed mostly vary on how this charge-free state is actually identified. William Zisman from Harvard University introduced the nulling concept and the vibrating electrode method in 1932. When the tip is vertically vibrated across a sample, the capacitance will differ as the distance changes. This causes charge to flow, resulting in an AC current. The backing potential, at which AC current is 0 (nulled) or at a minimum, is observed equal to the CPD. This approach results in the development of systems that automatically monitor shifts in contact potential as a result of changes in the sample’s work function. Combining the Kelvin method with AFM was first attempted by J.M.R. Weaver and coworkers, who accepted the nulling concept to locate the charge-free point, and tapped the special capability of AFM to identify tiny forces and force gradients. The main idea is that when the charge disappears, both the electric force gradient and the electric force between the two plates of a capacitor will turn into 0. It is appropriate to call the method Kelvin probe force microscopy (KPFM), as was done by Nonnenmacher in 1991. The KPFM technique paved the way to determine CPD, and work function in the nanometer regime. 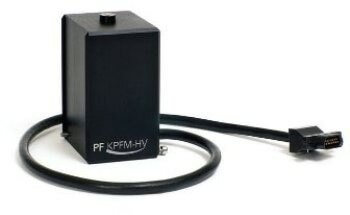 The combination of FM-KPFM and AM-KPFM are based on electric force gradient and electric force detection, respectively. According to the above equation, the AC bias applied at frequency ω promotes the electric force to modulate at ω and 2ω, which can be directly quantified with cantilever deflection. The forms, recommended by the above equation, is shown in Figure 2. Figure 2. DC deflection (top), amplitudes at frequency ω (center) and 2ω (bottom) when the DC tip bias is swept while an AC bias with frequency ω is superimposed, corresponding to the DC term, ω term and the 2ω term described in equation 1. Interestingly, the most significant fact is that oscillation amplitude at ω (given as amplitude 1) falls down to 0 when VCD is equal to VCPD, - the basis for "nulling" the electric force to locate surface potential in amplitude modulation KPFM. Likewise, VCD is equal to VCPD when the modulation amplitude of the electric force gradient at ω falls down to 0, the very basis for "nulling" the electric force gradient to locate the surface potential in frequency modulation KPFM. The modulated electric force, through the application of an AC bias between the sample and tip, can be easily determined using the cantilever oscillation. Often, the AC bias frequency is chosen to be the resonant frequency of the AFM cantilever to realize better sensitivity provided by the quality factor Q of cantilever. Utilizing the oscillation amplitude as input, the KPFM feedback modified a DC bias until the oscillation amplitude falls down to 0, when VDC equalizes CPD (Figure 3). Figure 3. AM-KPFM diagram. An AC bias with a frequency ω, typically the resonant frequency of the cantilever, is applied between the probe and the sample, giving rise to an alternating electric force between the probe and sample that causes the probe to oscillate. It is not easy to identify the electric force gradient as the force gradient modifies the cantilever’s effective spring constant. When a conductive cantilever is placed in an electric field, the effective spring constant of the cantilever is the sum of the electric force gradient and its natural spring constant k, the same effect of linking two springs in a parallel fashion. Modulation of the electric force gradient, as induced by an AC bias, leads to modulation of the cantilever’s resonant frequency. As prescribed in the equation, resonant frequency is modulated at the AC bias frequency ω as well as at its second harmonic 2ω. On mechanical shaking of the cantilever at its resonant frequency ω and concurrent application of an AC bias at frequency ωm, typically a few kHz, the modulation of the resonant frequency results in two pairs of sidebands at ω ± ωm, and ω ± 2ωm (Figure 4). Figure 4. Amplitude vs. frequency plot of the vertical deflection signal recorded with high-speed data capture when a MESP-RC probe is shaken, near a sample surface, by the tapping piezo at its resonant frequency while an AC bias of 2kHz is applied, illustrating the emergence of sidebands due to AC bias-induced frequency modulation. The resonant frequency modulation amplitude is determined by the sideband’s amplitude. The point of VCD=VCPD can be acquired by utilizing the sideband’s amplitude at ω ± ωm for KPFM feedback, and modifying the DC bias until they vanish completely. With regard to practical implementations, the amplitude of the sideband is rarely determined at the sideband frequency with a single lock-in amplifier. Two cascaded lock-in amplifiers are used in a more standard technique, with the first lock-in amplifier locking at the resonant frequency, whose phase output is fed into the second lock-in amplifier that locks at the AC bias frequency. The amplitude sum of ω ± ωm is determined by the amplitude output of the second lock-in amplifier. The ω ± ωm is subsequently applied for KPFM feedback (Figure 5). Figure 5. FM-KPFM diagram. An ac voltage is applied to the tapping piezo to oscillate the AFM cantilever at its resonant frequency ω. An AC bias at frequency ωm, usually a few kHz, is applied between the probe and the sample, modulating the resonant frequency. Two cascaded lock-in amplifiers are used to detect the sum amplitude of sideband pair ω ± ωm. Probe modeling provided a better understanding about spatial resolution and precision rendered by the two KPFM modes. A practical but simple method was used to model the probe to better understand the amount of the tip that needs to be included to account for 50% of the total electric force gradient in FM-KPFM, or 50% of the total electric force in AM-KPFM. The capacitor model of sample and probe was initially used, and the probe was approximated to contain a tip cone with a point end and a micro-cantilever (Figure 6). Since the probe is a good conductor, the probability is uniform throughout the probe, and charges exist only on the surfaces. The combined capacitance of the tip cone and cantilever can be expressed analytically. Electric force gradient and electric force are interpreted from the first and second derivatives of capacitance. Figure 6. Model of a KPFM Probe with a rectangular cantilever. The capacitance of the cantilever is an integration of capacitance of each tiny rectangle along the cantilever. As the same force would cause different deflection depending on its distance to the base of the lever, the capacitance is normalized to recognize this. The simulation result of the SCM-PIT probe is shown in Figure 7. The probe possesses the following geometry: cantilever 30 µm wide, 225 µm long, cone half angle of 22.5°, and tip 10 µm tall. The comparative contribution of the tip cone, combined to height (h), against complete interaction, is plotted against the height of the tip (Figure 7). Figure 7. The contribution of the tip cone integrated up to height h over total electric force (blue) and electric force gradient (purple) are plotted versus height from tip end for a SCM-PIT probe. Geometries are: cantilever 225 µm long, 30 µm wide, tip 10 µm tall, and cone half angle of 22.5°. The "BLUE" plots are electric force at tip-sample separation 5 nm and 50 nm. The "purple" plots are electric force gradient at tip-sample separation 5nm and 50nm. In order to measure KPFM’s spatial resolution, the similar definition utilized by Cohchero was implemented, i.e., the ring’s radius at the height till which the integral contribution of the tip cone justifies half of the total electric force gradient for FM-KPFM, or half the total electric force for AM-KPFM. In the case of AM-KPFM, when lift height measures 5nm, the relative contribution of the entire tip cone remains less than 50%, implying that its spatial resolution is controlled by the thickness of the cantilever-on the micrometer scale and also indicating that the acquired CPD is not local, but rather a convolution across the large area enclosed by the cantilever. This questions its level of accuracy, except for large and homogeneous samples. However, in the case of FM- KPFM, lifting the tip 5 nm over the surface, 50% of the signal is collected from up to 15 nm above the end of the tip, corresponding to 12 nm diameter. This implies that 10 nm resolution could be obtained with the FM-KPFM technique. The acquired CPD data is local to the area just beneath the tip providing convincing precision. When the tip is lifted higher, say for example, 50 nm above the surface, the spatial resolution decomposes to about 200 nm. This shows the reliance of spatial resolution on sample-probe distance. Although the modeling described above is just a first order approximation, it would be useful to gain a theoretical understanding because it does arrive at the same conclusion as Colchero, who applied entirely different kinds of assumptions. It was observed that the electric force from the cantilever and tip cone tends to predominate over that from the minute tip-apex, so AM-KPFM does not serve as a suitable quantitative nanoscale measuring tool. In contrast, FM-KPFM, where dominating electric force gradient signal arises from the tip-apex, provides precise local CPD data and high spatial resolution. The impact of tip geometry on spatial resolution is less important. Surface potential measurements can be accessed on the nanometer scale by using the KPFM technique, which combines the AFM and Kelvin probe methods. Typically, KPFM works along with TappingMode™, but there are several reasons to integrate it with the well-established PeakForce Tapping mode. Table 1 shows the four possible combinations; the naming of individual combinations will be utilized in this article. A number of these combinations can be done in a dual-pass (lift-mode) manner in which AFM imaging mode is operated on the first pass and KPFM is operated on the second pass using lift-mode, or in a single-pass manner in which KPFM measurement and AFM imaging concurrently run on a single scan line. PeakForce KPFM™, the combination of FM-KPFM and PeakForce Tapping mode, combined the capabilities and advantages of PeakForce Tapping - ease of operation and concurrent PeakForce QNM capability - in addition to the excellent precision and spatial resolution of FM-KPFM. It can be optimally performed in a dual-pass manner. PeakForce KPFM can be implemented in a single-pass way, but not without affecting the KPFM performance. This is because interference arising from PeakForce Tapping can be severe at times. KPFM-FM is performed in a single-pass manner. While it can also be performed in a dual-pass manner, PeakForce KPFM provides all the required benefits. It would be useful to clear some uncertainty in the literature, where single-pass KPFM is not properly used now and then to refer entirely to KPFM-FM, although KPFM-AM can also be performed in a single-pass manner. A standard KPFM sample, supplied by Bruker, is patterned with silicon, gold, and aluminum strips. Both of the gold and aluminum films have a thickness of 50 nm deposited on an n-doped silicon substrate. Theoretically, when the tip remains on any one of the three varied regions, it is important to read a constant potential value or CPD. A staircase potential profile is anticipated across the three varied materials. However, a perceptible slope can be seen on each of the stairs of the possible profile obtained with PeakForce KPFM-AM. This can be easily elucidated by the probe modeling illustrated above. The possible data is a convolution from the tip cone, the tip, and the cantilever. While the tip is on a single material, the large cantilever encloses the other materials, thereby contributing a major part of the overall value. For example, when the tip remains on the silicon/aluminum interface, just half of the cantilever is over aluminum, with most of the other half over silicon, and a smaller portion extending over the gold. The ultimate quantified value ends up as a weighted average of the work function of silicon, gold, and aluminum. As and when the tip shifts away from the edge, aluminum contributes more than that of gold and silicon, giving rise to the slope. This is true for all of the interfaces, and speaks of the inferior lateral resolution of AM-KPFM as well as its incorrectness due to convolution. The stairs on the potential profile, obtained with PeakForce KPFM, are found to be mostly level, indicating that the dominant contribution comes from the tip apex. As a result, the contribution of cantilever becomes insignificant. The data validates the fact that FM-KPFM provides a relatively higher lateral resolution, due to the relatively better precision than that of AM-KPFM and the minimal contribution from the cantilever. Figure 8 shows height and potential profiles utilizing PeakForce KPFM and PeakForce KPFM-AM on the Bruker KPFM standard sample. Figure 8. Height (top) and potential profiles using PeakForce KPFM-AM (middle) and PeakForce KPFM (bottom) on the Bruker KPFM standard sample, on the same location and with the same tip (PFQNE-AL). This point is further demonstrated with the data obtained on a Sn-Pb alloy. The topography shows varied domains in the alloy (Figure 9, right), and these domains appear to be evidently resolved on both potential maps obtained with PeakForce KPFM (Figure 9, middle) and PeakForce KPFM-AM (Figure 9, left), with a slight variation that can be seen through qualitative assessment of the potential maps. However, their cross section shows a severe contrast. Figure 9. PeakForce KPFM and PeakForce KPFM-AM potential maps and cross section profile of a Sn-Pb alloy (60:40 by weight, at right is the topography (4µm scan). While PeakForce KPFM shows a difference of 240 mV between the two chosen domains, which is consistent with the work function variation between Pb (4.25 eV) and Sn (4.42 eV), KPFM-AM provides a mere difference of 97 mV, which is relatively less than the predicted theoretical variation, and half of what was observed from PeakForce KPFM. Once again, this emphasizes the better precision of FM-detection KPFM compared to AM-detection KPFM. The lateral resolution is defined as the tiniest dimension on which a certain precision (90%) can be obtained, the difference here being whether the difference can be resolved or whether the difference can be resolved precisely. Figure 10. Height (left) and PeakForce KPFM potential (right) map of single- walled carbon nanotubes (SWCNTs) laid on a Si substrate. A single strand CNT (pointed to by the upper arrow) sticks out of a CNT bundle (pointed to by the lower arrow), which can be resolved in potential map, but no longer with accuracy as the dimension is too small to give dominant contribution in FM- KPFM. A height and PeakForce KPFM potential map of single-walled carbon nanotubes (SWCNTs) is shown in Figure 10. The SWCNTs are laid on a silicon substrate. The 30 nm part indicates a CNT bundle with one strand CNT measuring about 2 nm in diameter and sticking out at the top, and this is displayed on the potential map. A difference of 30 mV from the substrate is acquired on the strand CNT, which is merely a third of that read on the CNT bundle (105 mV). While PeakForce KPFM is capable of resolving nanometer properties, it is not precise. Only a non-dominant portion is contributed by the smaller dimension to the entire electric force gradient, with the rest coming from the substrate and ending up with a relatively smaller contrast as a result of signal convolution. When PeakForce KPFM-AM is used, an even smaller value can be read, since the contribution from the tip-apex reduces significantly. This shows that PeakForce KPFM has nanometer resolving power and provides precise results on 10 nm or larger features. KPFM-FM integrates TappingMode AFM with FM-KPFM, while PeakForce KPFM integrates PeakForce Tapping mode AFM with FM-KPFM. 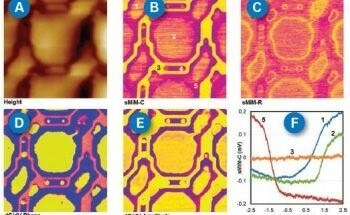 Theoretically, their significant difference mainly lies on the AFM side. PeakForce Tapping provides ease of use with concurrent quantitative and characteristic mechanical properties, and TappingMode affords phase contrast, leading to data uncertainty. When it comes to KPFM performance, a slight difference is anticipated, and this is mostly true with certain exceptions. Figure 11 depicts the potential maps on Sn-Pb obtained with KPFM- FM and PeakForce KPFM on the same spot using the same probe, PFQNE-AU, prototype. Using the two modes, the contrasts between Pb (darker) and Sn (lighter) domains were determined and these were found to be very similar, 235 mV and 240 mV respectively. However, their absolute values vary by roughly 100 mV, which is not fully justified. Figure 11. PeakForce KPFM and KPFM-FM Potential Maps and cross section profiles (top) of the Sn-Pb (60:40 by weight), and at bottom are the respective adhesion and phase imaging (4µm scan). PeakForce KPFM’s adhesion channel reveals a clear contrast between the Pb and Sn domains, showing good correlation with potential data and providing more assurance in the identification of domains. However, TappingMode does not show much contrast on the phase map. The PeakForce QNM is an excellent capability that enables concurrent quantitative nanomechanical property mapping, which can only be provided by PeakForce Tapping. This is additionally demonstrated on a polymer film containing low-density-polyethylene (LDPE) and polystyrene (PS) deposited on a silicon substrate. 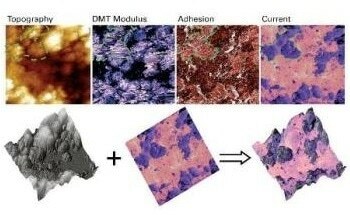 Besides the potential map, data related to adhesion, modulus, and deformation was acquired (Figure 12). Figure 12. PeakForce KPFM data including height, potential and quantitative mechanical property maps such as Young's modulus, deformation and adhesion on a polymer blend consisting of polystyrene (PS) and low-density-polyethylene (LDPE) (10µ scan). 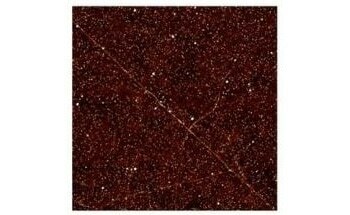 The tapping phase image obtained from KPFM-FM shows only a slight contrast on the Sn-Pb alloy sample (Figure 11). Though this can be regarded as a limitation of TappingMode in showing mechanical features, a small phase contrast is compulsory to make accurate KPFM measurement. Phase is used by frequency modulation KPFM as a way of frequency shift detection. Any major phase change resulting from the direct contact between the tip and the sample can be a source of error, which would ultimately lead to artifacts in the potential map. In light of this, if any major phase contrast occurs, the potential map should be least affected. This can be achieved by using light tapping, i.e., to use the highest possible tapping amplitude setpoint. Light tapping is a default setting in Bruker's implementation. Based on experience, light tapping is useful in majority of situations. However, it may not be adequate to prevent potential artifacts for specific samples when single-pass-based KPFM-FM is run. Sometimes, phase contrast can be so powerful that even single-pass KPFM-FM would not be able to eliminate phase cross-talk, for example on strong dipole polymers. In such a situation, dual-pass based methods should be used, where adequate lift-height can be utilized for the tip to clear the surface of the sample and remove phase shift resulting from direct contact between the tip and sample. In this regard, PeakForce KPFM has been shown to be valuable, and can even be used to detect potential artifacts. Whenever the lift height is changed incrementally and if potential contrast displays a sudden change in response to a slight change in lift height, then it can be determined without doubt that the acquired potential contrast below a specific lift-height includes artifacts. This effect is shown in the imaging of a sample of brush polymer on mica, where on changing the lift height from 25 to 27 nm, the chain structure vanishes completely rather than a blurring of the potential contrast on the chains as the tip moves up (Figure 13). At smaller lift heights, the chain pattern observed is the result of artifacts. PeakForce KPFM offers a new way to detect and remove potential artifacts arising from direct contact between the tip and sample. Figure 13. Sequential PeakForce KPFM maps of a brush polymer sample on mica substrate versus lift height. An abrupt change in potential contrast is observed when lift height increases from 25 nm to 27 nm, suggesting that the potential contrast of the polymer chains seen at a lift height of 25 nm or below are artifacts, caused by phase shift from direct tip-sample contact. Scan size is 250 nm. The inset at the upper-left corner is the height image. It should be noted that KPFM-FM provides certain benefits when imaging features that are smaller than several nanometers. This is because the average separation of the tip and sample can be kept smaller than that attained with lift-mode-based PeakForce KPFM. Conversely, this does not compensate the considerable benefits rendered by PeakForce KPFM. Apart from KPFM potential data, KPFM phase data is also acquired at the same time, which can be quite useful. It mirrors the sample’s dielectric constant contrast. As a reference to equation 2 given above, the second derivative of capacitance, which relies on the material’s dielectric constant between the conductive portion of the sample and the tip, can be acquired from the 2ω term. The same can be acquired from the DC term, particularly when VCD=VCPD, which happens to be the case when KPFM is running actively. This is comparable to the phase imaging of electrostatic force microscopy (EFM) with the added benefit that dielectric data and work function are isolated, while the normal EFM phase imaging is a combination of dielectric data and work function. Though it has been shown that repeatability of relative contrast in a single KPFM image has been practically good, even while using the same type of probe, absolute values can differ hundreds of mV from one experiment to another. As such, a major step is to enhance the measurement uniformity toward quantitative work function measurement. Using a novel probe design along with optimized instruments, several ways were identified to limit probe-to-probe measurement scatter to within a standard deviation of 50 mV. This presents a key advancement for measuring KPFM, which in turn extends the utility of KPFM in more demanding applications. Some of the major sources contributing to measurement inconsistency are listed in Table 2. As such, a ScanAsyst® KPFM operation mode was used to resolve these uncertainties. It is similar to ScanAsyst as it offers automated imaging optimization yet varies in its technical implementation. In the case of ScanAsyst KPFM, the algorithm looks for the cantilever’s resonant frequency using thermal tune to assure the consistency and precision of the operating frequency. When performing KPFM-FM or PeakForce KPFM, the cantilever is constantly driven to a free-air oscillation amplitude of 20 nm, and the drive phase is automatically and precisely set all the time. Potential DC current flow between the sample and tip is eliminated with a proprietary probe design, and the silicon tip that is uncoated ensures that no major work function change occurs from tip wear, as is often the case with metal coated probes. These improved capabilities have considerably inched KPFM repeatability. The repeatability acquired with nine varied PFQNE-AL probes on the Bruker KPFM sample is shown in Figure 14. Figure 14. PeakForce KPFM data obtained using nine different PFQNE-AL (Bruker) probes on the Bruker KPFM standard sample. The value on Al (grey triangle), Au (gold triangle) and their differences (blue diamond) are plotted. Standard deviation of each is listed at right, which is on the order of 5x improvement over traditional KPFM measurements. A typical deviation of below 20 mV was obtained in the potentials quantified on a gold strip, an aluminum strip, and in their potential variation. Proper calibration of the tip work function helps in deducing a precise work function of the sample. Additonally, the ScanAsyst KPFM mode provides ease-of-operation. However, it should be noted that under UHV or without air damping, the Q of standard EFM probe would be many times larger than in air, promoting increased signal amplification of the FM-KPFM in ambient conditions, because the signal convoluted from the tip cone, tip apex, and the cantilever is sufficiently large with traditional EFM probes. However, the low Q in air presents a practical issue in the detection of FM-KPFM, where the signal is not strong enough because most of the signal comes only from the lower portion of the tip cone and from the tip apex - the same reason that FM-KPFM has superior spatial resolution. A large Q/k ratio (larger Q and smaller spring constant) is expected from the probe. PeakForce KPFM creates the potential for enhancement, compared to the TappingMode KPFM-FM. In TappingMode, the cantilever should have a large spring constant so to resolve capillary forces from water layers present on the surface of samples. Also, the Q should not be too large as that would restrict the TappingMode bandwidth. These limitations are resolved by PeakForce Tapping, enabling the use of cantilevers with a relatively larger Q and smaller spring constant and thus providing space to optimize the probe. At present, PFQNE-AU probes are two times as sensitive as the SCM-PIT probes commonly utilized. Probes with higher Q/k ratio can be developed to additionally enhance the sensitivity of PeakForce KPFM. 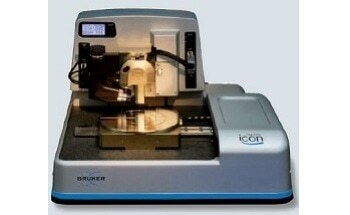 Bruker Dimension Icon® and MultiMode® 8 AFMs include all KPFM modes, which be utilized in tandem with a wide range of accessories. For samples requiring rigorous environmental control, for example, cathode materials, lithium battery anode, light emitting devices, or organic photovoltaic, a 1 ppm-level of water and oxygen capable glove-box can be utilized (Figure 15). The glove box solution has been shown to be useful for measurement repeatability of samples, including most metals and semiconductor materials, that are subject to change on exposure to ambient air. Figure 15. Turnkey glove-box enabling all AFM functions to be performed in a 1ppm level oxygen and water environment. Shown inside is a Dimension Icon AFM, a version of glove-box for the MultiMode 8-HR is also available. The Dimension Icon system features the Photoconductive AFM module, which is compatible with the proven Newport solar simulators to allow uniform, backside illumination of sample over the scan area. This enables KPFM potential mapping and simultaneously illuminating with attainable intensities comparable to 300 suns, allowing the analysis of dynamic and static photovoltaic responses to illumination of organic materials and solar cells. Figure 16 displays PeakForce KPFM data on a MDMO (poly[2-methoxy-5-(3',7'-dimethyloctyloxyl)]-1,4-phenylene vinylene)-PCBM ([6,6]- phenyl C61-butyric acid methyl ester) bulk heterojunction solar cell; work function down-shifts 535 mV under illumination replicating an intensity equivalent to 300 suns. Figure 16. PeakForce KPFM Potential map (third from left) of MDMO-PCBM bulk heterojunction solar cell on an ITO substrate in dark (bottom half) and under illumination with an intensity equivalent to 300 suns (top half). A 535mV downshift of work function is seen under illumination, a 3D rendering and histogram of potential data is at the right. Sample courtesy of Dr. Philippe Leclere, University of Mons. KPFM-HV is a dual-pass method with PeakForce Tapping as the base AFM mode. It stands for High-Voltage KPFM mode, which determines electrostatic potential further than ±10 V. There are questions surrounding why such a high voltage would need to be measured. KPFM determines the work function disparity between the tip and sample. On looking through the elements’ work function table, 5.93 eV (Osmium) is the highest work function and 2.14 eV (Cesium) is the lowest work function. The highest possible work function variation will not go beyond 3.79 V. Up to ±10V is covered by all the KPFM methods described above, and is adequate for any task related to work function measurement. dC/dz mirrors the dielectric constant differences across the sample. KPFM-HV is applied in a dual-pass manner. PeakForce Tapping is utilized to acquire mechanical properties and topography on the initial pass, and while on the second pass or lift-mode, PeakForce Tapping drive is halted, and an AC bias with a frequency less than 50% of the cantilever resonant frequency is applied between the sample and the tip (Figure 17). Figure 17. KPFM-HV diagram, in the first pass, surface topography and mechanical properties are obtained in PeakForce Tapping; in the second pass, an AC bias at a frequency lower than half of the cantilever resonant frequency is applied between the probe and the sample, which causes the probe to oscillate at frequency ω and its second harmonic 2ω. The electric potential between the tip and sample is calculated based on the oscillation amplitude at frequency ω and 2ω. Note that no KPFM feedback is involved. Two synchronized yet separate lock-in amplifiers are concurrently fed with the vertical deflection signal; one lock-in amplifier was used to track the phase and amplitude at the drive frequency, and the other was used to detect the amplitude at the second harmonic. Measurement is done in the background to acquire electrostatic potential variation ΔΦ and dC/dz. This approach helps to measure voltage in the range of ±200 V with less than 15% error. It is also possible to measure higher voltage of up to ±1000 V with precision that is only restricted by nonlinearity of photodetectors in the AFM. This method is available on MultiMode 8 AFMs, without any need for extra hardware as well as on Dimension Icon AFMs; a PeakForce HV module is needed to reduce measurement distortion resulting from electronic interference). There are certain polymers that can be charged via contact electrification. 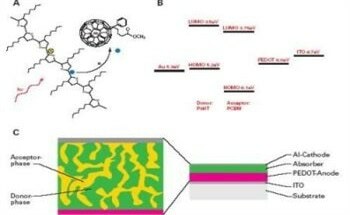 Merely contacting and then isolating two dissimilar or similar polymer pieces, or contacting it to and then isolating it from a conducting surface, promotes charge on surfaces that are being contacted. The potential map (left), phase (middle), as well as a 3D rendering of the potential map of a polydimethylsiloxane (PDMS) film is shown in Figures 18 and 19. Figure 18. KPFM-HV images of PDMS (polydimethylsiloxane) films after being charged by peeling off from the silicon substrate upon which it was cast. The HV Potential data (left) shows the electrostatic potential and the sign of charge; HV Phase data (middle) denotes negative charge with negative phase, and positive charge with positive phase. At the right is a 3D rendering of the potential map, the negative charge gives rise to an electrostatic potential of -99V at its center, and some of the adjacent positive charges go as high as 158V. Figure 19. KPFM-HV potential map on PDMS, encasing five previously scanned sites in a square-center arrangement. Sequential images from left to right reveal that the negative charges are accumulating, spreading out and merging with each other as scanning goes on. Sample preparation is done by depositing a PDMS film of 0.5 mm thickness on a silicon wafer. A piece is removed from the silicon substrate to image its underside. The potential map reveals the electrostatic potential mirroring sign that is learned from the phase data as well as electrostatic charge density (or absolute value). The 3D rendering reveals at least -99 V at the middle of a negatively charged area, with positive charges featuring a high 156 V electrostatic potential. It is easy to acquire PDMS samples. A PDMS gel-pad can be often seen in AFM probe packaging. Here, a piece of gel-pad can be cut from the base of an AFM probe box and can be charged using the contact electrification method. It is also possible to introduce charge via triboelectric charging, which is a type of contact electrification done through rubbing, for example, by continuously scanning the same area for a prolonged time period. Figure 19 (left) reveals five earlier scanned sites having negative charges. Sequential imaging denotes the negatively charged areas scattering out and combining with one another as scanning continues. KPFM-HV mode offers a simple way to determine electrostatic potential of trapped charges as high as ±200 V.
Table 3. shows a probe selection guide for individual modes. For current data, guidance is given in the NanoScope® software. While other probes not specified in the list can also work, their performance with respect to KPFM measurement sensitivity, precision, and/or repeatability could not be ensured. It realizes high repeatability via rigorous parameter control using the new probe design and the ScanAsyst KPFM operation algorithm. It maintains the high spatial resolution and precision of FM-KPFM (probe modeling shows that FM-KPFM provides a 10 nm resolution without affecting the measurement precision, unlike the micrometer-scale resolution afforded by AM-KPFM). It exploits PeakForce QNM to create concurrent electrical and mechanical data, thereby improving its material identification power. It promises more improvement to FM-KPFM sensitivity (PeakForce Tapping prevents the limitations on probe selection caused by TappingMode, and cantilevers having higher Q and lower spring constant can be used for better sensitivity). PeakForce KPFM has advanced towards quantitative and high-resolution work function measurements. It is well set to address the major complications in those applications that require improved precision and repeatability as well as higher spatial resolution. With industry-standard applications on organic materials, semiconductor materials, and metals, the excellent capabilities of PeakForce KPFM promise considerable advantages for sophisticated application areas, including bio-materials.